When people say that every pregnancy is different, this is true. The pregnancy symptoms that each pregnancy brings are certainly not the same and every pregnancy a wholly different experience from one to the other(s). Since I've only been pregnant twice, needless to say, I can only compare my first pregnancy experience to second one. When I was pregnant for the first time, it seemed like everyone treated me like a spoilt and fragile princess. I was told to rest and eat as much as possible. I was advised not to carry heavy stuff nor do tiring house chores because I had a bun in the oven. I was heavily encouraged to pamper myself for as long as I could. There were times when my MIL told my husband to fulfil all my craving requests and bring me out for travelling or sightseeing before our baby was born. Bliss. I too, spent quite some time, soaking the joy of quiet moments during my first pregnancy by taking naps and good night sleep as much and often as I could. When I got tired or sleepy, I didn't think twice to hit my bed and hug my favourite bolster. Also, I took extra care of myself during my first pregnancy because I think I was so novel to the whole pregnancy thing, worried more and tried to be at my tip top condition by eating healthy and taking light exercises. Days seemed to pass slower than normal back then because I kept on counting each day passing by and always calculated of how many more weeks and days I had to spend before finally meeting my first baby. I also invested significant amount of time to read loads of info and tips on pregnancy and giving birth. Clearly, I spent more time updating my blog with my pregnancy stories as well. Being pregnant for the second time, I feel that time flies faster because I am generally busier and have no time to 100% focus on my second pregnancy. I thought I just found out that I was pregnant again not long ago and now I'm already on my second trisemester? Some days I even forget or don't feel like I am pregnant (thanks to no morning sickness?). Everyone deems that I am not a newbie in this field anymore; hence, I am showered with lesser meticulous attention and tender loving care. In short no more extravagant treatment from family and relatives. I carry heavy stuff on daily basis and by this I mean toting around my very active 14kg toddler when she needs or has to be carried. On top of taking care of my girl, I still have to juggle my time to complete my daily house chores, cook and do my work. Tired? Oh, deal with it. This is life, Mom. Anyway, while our second baby is indeed loved as much as our first one, I think I don't "celebrate" the second pregnancy as much as before and following are the examples. When I was pregnant with Naomi, I always had trouble sleeping the night before seeing my gynae. Why? Because I was too overexcited to see my baby via the ultrasound scan and get the sonogram print-outs after my antenatal visit the next day. I always felt that monthly antenatal visit was way too long to bear. Why monthly? Why not bi-weekly? I wouldn't allow my printed USG images to be crumpled. The moment I reached home, the first thing I did was labelling and carefully putting the pictures inside an album for the sonogram print-outs, in chronological order. I admired every bit of the blurry black and white latest USG pictures of the month for the longest time. I asked my husband to examine them as well until he got really annoyed. Sometimes I brought the album for toilet reading and analysed my baby's USG pictures once more before bed time. For baby #2, I am still excited for the monthly gynae appointments to check on baby #2's progress and see him/her via the ultrasound scan but I can sleep just fine the night before we have to go to the hospital. I still keep the pictures in the album but often times I don't immediately put them in the album after I reach home. I put them inside my bag or on top of my desk and only put them in the album when I got the time or remember that I haven't done so. The USG print outs sometimes are crumpled a bit because I place them inside my wallet but I told myself that it's not the end of the world if the pictures are slightly crumpled. Hey, sometimes we tag along Naomi to the hospital to see the gynae and I need to be fast in putting everything back into my bag so I can attend to her, aye? I still look at baby #2's USG pictures and keep soft copies of them but I don't examine them excessively. When I first got pregnant, the first belly photo taken was at 8 weeks. My husband snapped my belly pictures regularly so we could see how my belly was changing in 40 weeks' period. I got nice pictures of "Me and My Bump" from all first, second and third tri-semesters. For baby #2, I didn't forget to take belly pictures in my first tri-semester but I kept delaying the process until I missed the whole thing and only managed to get my first belly pictures properly taken at 12 weeks. Ta-da! I downloaded few pregnancy apps to my smart phone when I was pregnant for the first time to specifically remind me how far I was along. When people asked me "How many months pregnant are you now?" I could exactly tell them how many weeks and days I was at with the baby. In addition, every week I was anxious to find out how big my baby was at that point of time. Size of teeny-weeny poppy seed? Lemon? Pumpkin? Watermelon? I also loved to watch the baby development videos in those apps over and over again. Those apps were so crucial to me and I checked on their updates and read their daily tips every single day. My favourite apps back then were Baby Center, What to Expect and Baby Bump Pregnancy Pro. Plus another few bunch of baby names apps. Seemingly I still keep Baby Center app from my previous pregnancy in my phone. However, I have forgotten my Baby Center login password so I cannot access it but it's no biggie. I just re-downloaded What to Expect app lately and signed up for their newsletter via email. Truth is I barely open the app either these days. I know how many weeks I am with baby #2 now but I am not really aware of the precise week and days of his/her gestation age. I am not sure with the size of baby #2 this week because I don't check, let alone memorize the gist of weekly updates from the pregnancy apps. I am also seriously considering of unsubscribing these apps' weekly newsletters because they are spamming my mailbox. Emails that I typically delete without opening equal to spam, right? First baby: "We don't really care of the baby gender as long as it is healthy". This law applies to most, if not, all of us, doesn't it? Second baby: "I already have a girl, hence it would be ideal and wonderful to have a boy now..." And vice versa. Having a healthy baby is indeed utmost important and top priority, but in all honesty, deep down inside we'd love to have a pair of them, wouldn't we? For our first baby, my husband and I had almost everything ready long before I was due to give birth. Although I was not a very crafty Mommy who went pretty detailed with her baby nursery, I began shopping baby stuff even before we knew the gender of our first baby. The first baby items I bought were in neutral colour. We had our long list of what to buy and purposely went to Baby Expo in Kuala Lumpur to get them as if that was a rare event that was not going to be repeated. Almost everything we got for Naomi was brand new, except for her baby cot. For baby #2, I could only think of the hand-me-down Naomi's baby stuff. Well, unless baby #2 is a boy then we'd get more boyish and blue items for him. I filled my closet with quite a bit of maternity clothes when I was pregnant with Naomi. My Mom also gave me few maternity clothes that she purchased in Thailand in early 2012. I think I bought new sets of maternity clothes for each of tri-semester when I carried my first baby in my tummy. For the coming months, not-so-tight dresses, stretchy leggings and loose shirts that are already in my wardrobe would be good enough for me. As long as those clothes are comfortable and can hug my soon-to-be burgeoning belly well, I think those clothes would do just fine. I don't really plan to add more collections of maternity fashions to my wardrobe because I know these clothes are only wearable for few months. I was super conscious with my diet when I was pregnant for the first time. I religiously followed all the pregnancy food restrictions I found in the internet then. This time around, I have relaxed the rules of my pregnancy diet and eat almost everything I feel like eating in moderation. I skip eating stuff that would put my baby at risk like raw meat, alcohol and so on tho'. But I won't deny the fact that nowadays I occasionally indulge myself with a set of McD's value meal, instant noodles and sushi (that contains no sashimi and such) when I really want to. Our immune system runs at low speed during pregnancy. Getting sick frequently happened during my first pregnancy and is happening again during my second one. Real bummer. I often got colds, flu and throat infection when I was pregnant with Naomi and always rushed to see my Gynae when I was sick. Seeing a gynae in a private hospital to beat flu bug and its comrades cost me more in terms of money and time. Further, there was a time when I got sick but my gynae referred me to the general physician in the hospital instead because she just had too many appointments that day. Learning from this experience, when I fall sick (but not a serious illness) during my second pregnancy, I just see the usual general physician in the neighbourhood and get some mild prescribed medication from this doctor. This way, I would be treated faster and seeing general physician here costs me less $$ for the consultation fee than a gynae in the private hospital. My husband often took me for a walk in the park or evening swim when I was pregnant with Naomi. I had so much extra time to do a little bit of exercises here and there during my first pregnancy. I would even consider joining pre-natal exercise classes if there were any in town. My 19 m/o who keeps me busy. These days, my pre-natal exercises would mainly revolve around taking care of Naomi. Intense physical exercises happen when we take Naomi to public places like malls, playground or a park. Running around to keep up with her or preventing her from doing anything funny in public areas counts as resistance training, muscle building, breathing exercise and calorie burning to me. My active toddler keeps me active. No bluff. While I constantly thought of giving birth when I was still pregnant with my first tot, I was considerably very calm in handling it. There was no specific birth plan because my only plan was to give birth naturally and would not resist C-section in the event of emergency. That's it. I also convinced myself that giving birth is just a day of suffering and it's just inevitable. What comes next would last longer. Yet, with the whole giving birth and post-partum experience on-hand, I am a tad concerned and fearful of having to go through the painful ordeals again. Then, I didn't know the labour pains for real but now I know the definition of labour pains from natural childbirth plus the stomach cramps and episiotomy pains that come after that. Therefore, sometimes, I am still chickened out when I think of giving birth for the second time. Not to mention the logistics for Naomi when baby #2 arrives. Will Naomi be okay when I am busy with the newborn? Will she miss Mommy's full presence? Can I handle both children at the same time? Few weeks ago I stumbled upon green sagu mutiara (sago pearls) at a local supermarket. I noticed that a medium pack of sago pearls didn't cost much so I bought one. Since I happened to keep some jack fruit in my fridge this week, I thought of turning my sago pearls into some nice Indonesian dessert, which my Mom often made back then, and serve it with the jack fruit. Two days ago, I decided to cook my sago pearls by putting 1/4 of the pack onto a half pan of water and planned to boil them together. When Naomi's Nanny saw me doing this, she asked me what I was doing and prompted that my sago pearls' cooking method was all wrong. She advised me to soak the sago pearls in a bowl of cold water for few minutes then cook them in boiling water whilst stirring them constantly. In the end, she offered to cook the sago pearls for me. I was like "Okay... Go ahead." and I went upstairs. Minutes later, the Nanny told me the sago pearls was ready and she was going to go home. After the Nanny left, I checked on the sago pearls that she cooked. I thought something went terribly wrong here. The sago pearls in the pan smelled weird (burnt? ), very watery and shapeless. I could not see them in the form of pearls at all. They looked slightly more like melted agar-agar. In the end, I had to waste them since I thought this would not be edible either and began making sago pearls again from zero. This time I did a bit of internet reading before started experimenting with the sago pearls. One source in the internet mentions that to avoid mashed sago pearls, we don't have to soak the pearls in the water and start cooking them right away. I tried this method and it worked. Perhaps, some kind or specific brand of sago pearls just doesn't require any soaking? So here you go, the recipe that I used to make the sago pearls dessert. It is based from this source. By right, this dessert should be easy to prepare; it's just that we need to be a bit wary when cooking it so it doesn't stick to the pan (especially if this is your first time cooking it). Constant stirring is required when cooking sago pearls but not over-stirring as this will ruin the final result of the cooked sago pearls. My first home-made Bubur Sagu Mutiara. To cook the sago pearls: Bring water to boil. Add in sugar and 2 pandan leaves into the water. Make sure the sugar dissolve in the water. Once the water is boiling, pour the sago pearls into it. Lower the heat to medium. Keep stirring (but not over-stir) the sago pearls so it won't stick to the bottom and side of the pan. Cook the sago pearls until it thickens and produces jelly-like and translucent consistency. You may want to taste it to check if it's sweet enough. If it isn't, add some sugar. Also, if the water is not enough to cook through the sago pearls, it's okay to add some water into the pan while cooking. Once done, set the cooked sago pearls aside and began cooking the coconut sauce. To make the coconut sauce: Bring to boil coconut milk, salt and pandan leave. Stir the coconut milk once a while when cooking it. Once done, set aside. To serve: Put some sago pearls in a small bowl. Top it with some jack fruit cubes and few spoons of coconut sauce. Best served warm. Simple Indonesian style sago pearls dessert. In the future, I think I'd need to buy sago pearls that are sold by trusted manufacturer (or branded). The one that I bought was actually supermarket label sago pearls and I am not so satisfied with its quality. In addition, it is best to use honey jackfruit (nangka madu) for this dessert because this variant of jack-fruit has really strong aroma and very sweet. Anyway, for a first timer, I think I eventually got the hang of cooking the sago pearls correctly. I have been pregnant with baby #2 for about 12 weeks now and my second trisemester is pretty much here (yehey!). You do know that second trisemester is often considered as the best period of pregnancy, don't you? I visited my gynae for my 4th antenatal visit yesterday afternoon and she said she was doing a very important ultrasound scan on baby #2 yesterday. She checked little jellybean's bones and skull structures, heart, arms and legs and I am so grateful that everything turned normal. Although I still very much think about baby #2's gender and am REALLY curious about it, but when it times to lying on the gynae's bed for an ultrasound scan, I am more anxious about my baby's overall health. I just want baby #2 to be perfectly healthy and normal above anything. 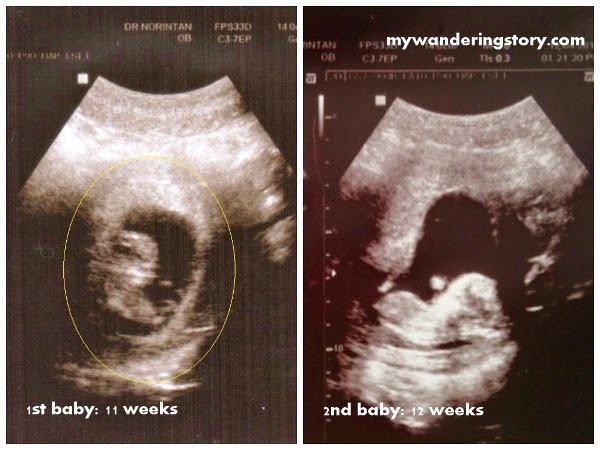 12 April 2014: Baby #2 at 12 weeks. I saw baby #2 started kicking around yesterday and it's so cute! He or she is about 5cm long now so it's still rather small and I can't even notice my pregnancy bump by now. Anyway, I had not gained so much weight so far I think. My gynae didn't mention about this yesterday because I actually missed the chance to get the nurse to record my weight etc as I arrived to the hospital pretty late. My husband asked me to weigh myself in the hospital's weighing scale and if I saw correctly, I only gained like 1-1.5kg to date! Given my bigger appetite and no morning sickness on my first trisemester, this fact is a bit hard to believe; especially since when I was pregnant with Naomi, I gained like 2 kg every month (I even nauseated and vomited once or twice back then!). Before I ended my antenatal visit yesterday, I casually asked my gynae if it's safe for me to perm my hair. My hair now looks crazy, thin and ugly so I always pony-tail it and am desperate to go to a hair salon to fix it. My gynae said perming hair during pregnancy is fine (phew! 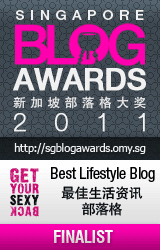 ), colouring hair is the one that is not recommended for preggers. So I think I'll be meeting my hairdresser for a hair perm next weekend. Finally, here's a picture of me with my 12 weeks' bump. Still not pretty obvious, is it? My husband took this picture of me last night just before we went out for dinner. By the way, please read my weekly pregnancy symptoms from my 2nd Pregnancy Journal. It's easier for me to update the symptoms there and I try not to relay the same messages I've written there in my blog posts to avoid repetition.